Yes. I do still have it.. still looking pretty good. I'll take a pic and post it. Haven't changed so much as a brake cable in the last 15 years. A few signs of rust but I'll keep it forever. Amazingly - he still has that black Master - hasn't changed since these pics at Tizer '88!! (nor has he!!). Loving the pics Gary. Remember Gary and Wee Brian Henderson. 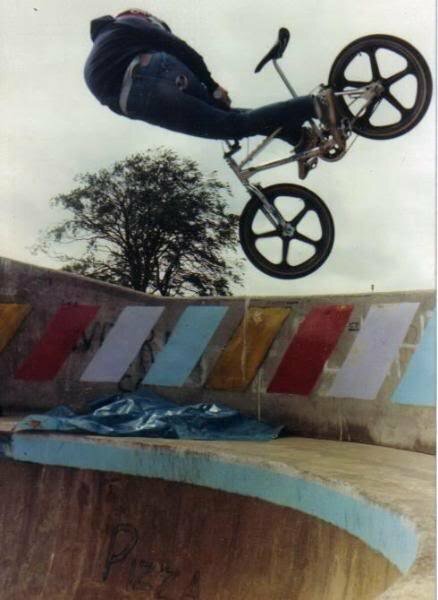 I was mates with theie older brother Mark and their Dad ran the BMX club. Framey and Scott too, they were all years younger than me though. When was this Scott Carroll pic taken as i'm pretty sure thats me sat down on the lip second in from the right. black/grey nike windbreaker. Jeez i was enjoying this thread and then my picture pops up, i cant even renember a livi King of the Skatepark contest!, brain must be fried, great pics everyone by the way. No way! Ricky Fleming! How the devil are you - never even knew you were on here! Don't think the pics of you are from the K.o.S., just another day I was riding at Livi - '85 or something like that. May well have been the same day this pic was taken of ME! Might help jog your memory! todd anderson and tony " the tiger" murry both used to go massive out of quarters , but mainly remember tony killing del mar skatepark, amazing. tony murray was mad as!!! had that photo on my wall BITD. still has me in awe now ! + as with andy brown , these MASSIVE airs are with a coasterbrake ! without dissing the new riders i just dont think a lot of people apreciate how bloody hard those things ( coasters ) were to ride when doin airs . I know what you mean - rode with a coaster for a while, on quarters too, but got spat off a few times as well- jumping up a kerb of all things, over the bars and headfirst into a hedge! Coasters bite! I never had a problem with a coaster but if I had known how easy it was without one I would never have bothered. I think we were scared of not being able to do 540 kickturns and rollback 540's but I have done them with a freewheel now. I did realise and drilled the coaster out of my Tuffs (!) and put a freehub in instead - went a lot higher after that! Funnily enough - used to pull rollback 540's all the time on a freewheel - but havin' trouble gettin past 360 now! Nice footplant by the way!, no i stopped riding in the eighties silly boy that i was, had a couple of trips to livi last year my mate bought a bike, was great fun but i didnt go that bit further and guy a bike again im into the mountain biking now and a bit of snowboarding did you stay into bmx right through then? Never stopped mate, although I did stagnate a bit! Still doing the same tricks I was 20 years ago! Only time I wasn't riding was for nearly a year after my bike got nicked. Apart from that, it's been 1983 to present day. Thinking about getting a new bike soon as well! June 2008, practicing table 180's out the bowl @ Kelvingrove. You thinkin of John Swanguen V.Noah? Think thats the spelling, if so thats real old skool. Aye....used to ride with both Dave and Ell! 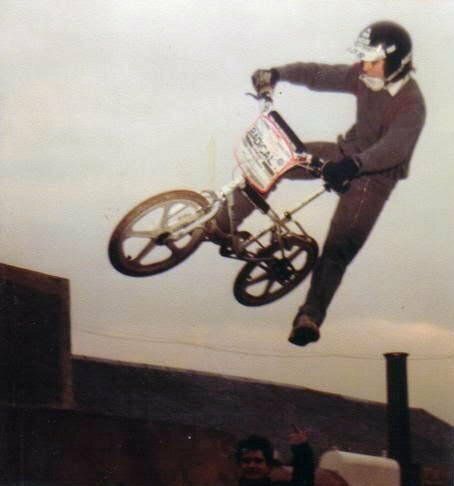 Anyone know if he is still involved in Bmx in anyway??? I thought it Chris Hamer... but didn't he air the other way?? No ideas Dave, I'm in touch with Dave S but not heard anything from Ell for years. I've asked James Hudson and he doesn't see him anymore so no joy. 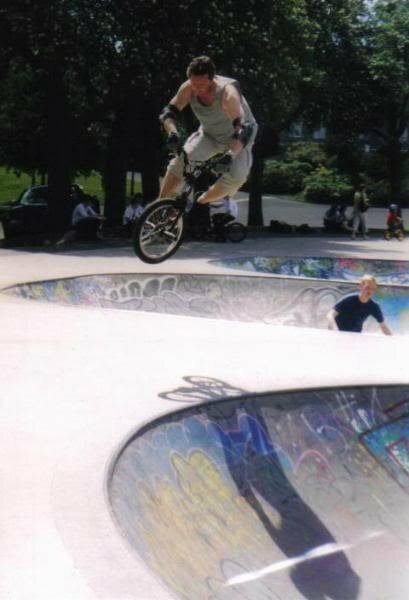 There was a guy on here ages ago that used to ride at the Hudson's ramp when I used to go there and he was still in touch with Sean Allinson so I was hoping he could have found out if Sean knew what he was up to these days. Other than that I've no ideas. He may come on here and not post or want to get involved, some do, not sure why but they do. It'd be good to catch up with him, we once had a little fall out at Alfreton over nothing but we still spoke after that. Jason Ellis is doing music things. I shall attempt to direct him here and you can kiss and make up about whatever it was at Alfreton. Chris hardy is still riding last I knew, was globetrotting. Top lad and one fookin amazing rider, still progressing last i saw. Its Sean Smith if i remember right,rode with him years ago.